Save on Starbucks and make your own delicious brew! It’s not the fact that they always write my name wrong (someone wrote Çony on my cup once…), it’s not the ridiculous long queues, not the aspiring film-writers with their MacBooks, not ultra-commercialized exploitation of an art-form… It’s the strawberry-mocha-frappucino-light-soy-latte with a squirt of hazelnut and a shot of I-don’t-know-what. It is liquid sugar with so much artificial flavorings that even kids can get their daily shot of caffeine (next to the unnecessary 800 calories). It’s too much, it’s so artificial, and it’s sooo bad for you… Why do we always complicate things? Can’t we just keep it simple for once? A Turkish proverb says “Coffee should be black as hell, strong as death, and sweet as love” If you ever had Turkish coffee you know what they are talking about! You either love this kind of simple coffee or you hate it! I can’t blame you for wanting something special once in a while, that’s exactly what I want too! If you have read some of my recipes you know that my flavors and combinations are often bold and sometimes go completely NUTS! But life is all about balance. Sometimes I just want to keep it easy, uncomplicated with just a hint of special in there. It’s not as bold, but modest and down-to-earth. Make your coffee special, but make it count! This will taste so much better and you can easily make it in your own kitchen. This time it’s your responsibility to decide what goes into it. Look at this beauty… who needs white paper cups with mermaids on it! Simply mix your 3 ingredients together! Make a cup of strong coffee in whatever way you prefer. In a small pot, heat your milk until it simmers, stirring occasionally. Do not let it burn or boil! Take the milk of the heat and break the chocolate into it. Stir to make the chocolate melt and infuse the milk. 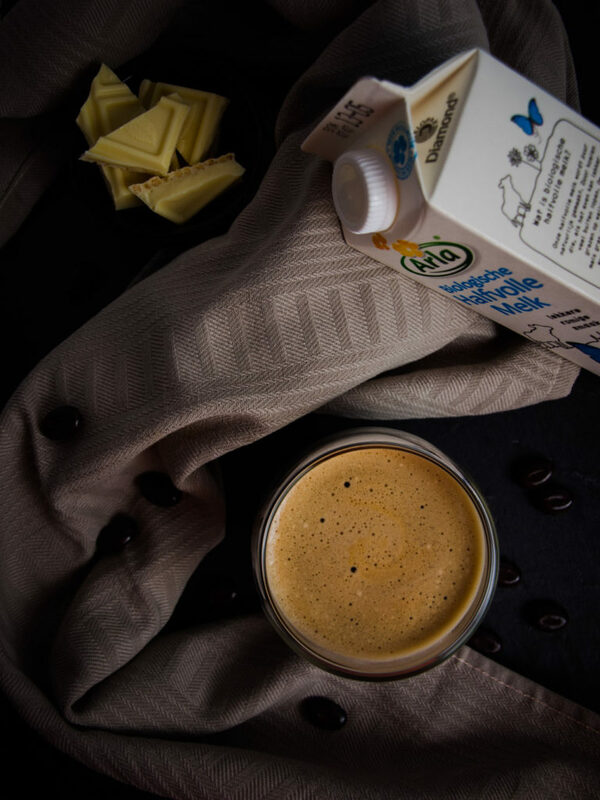 Add the flavored milk to your strong and freshly brewed coffee. Sit back, relax and enjoy your homemade flavored coffee! PS: I’m not endorsed by Arla in any way. It was just the package of milk that looked the nicest for the picture. Let me know in the comments what you think of this recipe! Have you ever made flavored coffee at home before? Do you think other types of chocolate or flavorings would be great in this as well? Or do you still prefer Starbucks over this? Omg you are so right about Starbucks – it’s poison disguised in a pretty presentation so so so bad for you. While I wait for my shot of espresso I am baffled by what I see that gets put into these drinks…it’s frightening and I can’t even imagine the calories?! Thank you so much for sharing this deliciously simple but all natural recipe?? thank you for this “Oh-there-is-no-cookie-in-the-house” coffee recipe. Sometimes I heat milk carefully with a piece of vanilla pod and add it to my strong coffee.